It’s no secret that our bodies change as we age. But despite a few aches and pains – and possibly, a few extra pounds – diet and exercise remain essential in our golden years. Of course, it can be difficult to establish good habits after decades of wellness neglect. Never fear, dear senior: it is possible, and the ancient art of yoga can help. Yoga is not a New Age form of exercise. Instead, it’s an ancient art that has been practiced for more than 2,000 years. It combines stretching, meditation, and balancing as tools for transformation. Doing yoga helps us assert control over our minds and bodies. There’s also a mounting body of evidence that suggests yoga and other forms of relaxation may even improve your internal systems, including your gut microbiome. You can think of your gut as a control station for your entire body. When your gut microbiome (bacteria and other organisms) is out of whack and unbalanced, you may feel tired, anxious, or uncomfortable. But exercising, and specifically, doing exercises that promote regular movement, can help boost this vital but hidden little world. Your diet and exercise habits can even have a big impact on your immune system, according to Plexus. Maintaining healthy bacteria is not achieved through exercise alone, however, and you will also need to prioritize how you eat. Make sure that you get a balance of prebiotic and probiotic foods so that your gut has all the tools it needs to remain stable. Elders’ Helpers suggest that seniors maintain a nutrient-rich diet that includes fruits, vegetables and dairy products. Yogurt is an example of one healthy food that fulfills nutritional requirements and provides beneficial bacteria for your belly. If you would like to get started with yoga, the good news is that it’s very easy. Your local community center is an excellent resource, as is the YMCA or other nearby fitness center. 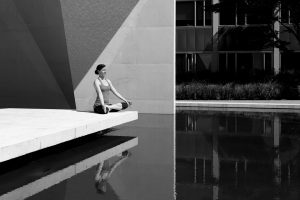 Many of these organizations offer yoga classes geared specifically toward the 65, 70 and up crowd. You can also look online for senior yoga classes near you. If you are concerned about affordability, contact your Healthcare or Medicare insurance. They can help you determine if your plan entitles you to free fitness center access. Once you find a class – or online videos – make sure that you are healthy and able to participate, so talk to your doctor. Together, you can evaluate the safety of beginning a new exercise regimen. They may advise you not to participate if you have a chronic injury that may become worse with repetitive movement. If you are given the green light, don’t run off to class just yet. Personal trainer and fitness guru Yuri Elkaim recommends that seniors stretch each day, and offers tips on stretching exercises here. Many yoga classes, even those not designed for older adults, can be easily modified for your mobility level. For example, instead of sitting on the floor to do your stretches, you may be able to stay at a more comfortable level by sitting on a chair. You will also be encouraged not to do more than feels comfortable. You will feel some muscle strain in the early days, but this will pass as you grow stronger and more flexible. If it doesn’t, call your doctor to check in and schedule a physical exam. Practicing yoga does not require any special gear, but that doesn’t mean that you can show up in jeans. Make sure to have comfortable, form-fitting clothing and a towel or mat for the floor. Your instructor may also advise you to purchase a few inexpensive foam blocks for extra support. Yoga isn’t just for teenagers. It’s a gentle exercise that you can begin at any age and in almost any physical shape. Doing so can keep you healthy in many ways from the inside out.